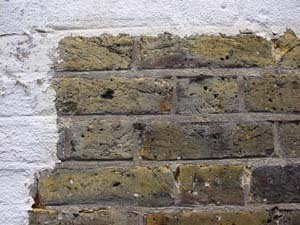 No authoritative bodies recommend abrasive techniques on old London bricks - both sand blasting and chipping damage or remove the hard outside layer of the brick, leaving exposed the soft, extremely porous middle. This will erode quickly and absorb any moisture causing further problems. 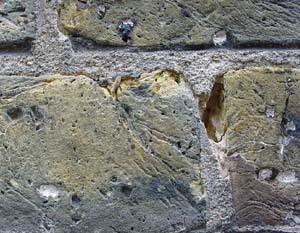 However, there is a good case for grinding; if done carefully it will cause a minimal loss of brick. This process makes re-pointing easier as the brick arrises (corners) will be made sharper so that joints can be well-filled without spreading around the bricks. A number of companies now supply chemical strippers and either will apply them for you, or have approved contractors to help. 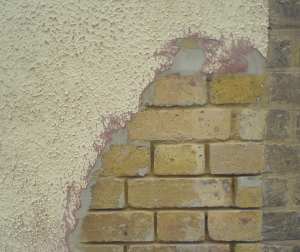 The picture below shows what can be achieved in a difficult case with an unknown paint to be removed. With one of the common finishes, an even better result can be achieved. The chemical is applied, typically with a brush. Once the paint is soft, a high pressure water cleaner is used to remove the stripper and paint. 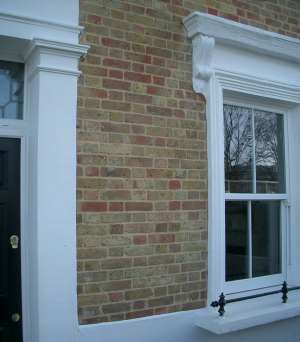 If the paint is persistent, as in the case below, some minor damage will be caused to the pointing and brick surface. You can follow an example project as an Edwardian house is stripped of its paint. For companies specialising in this area, see the Products and Services Directory.